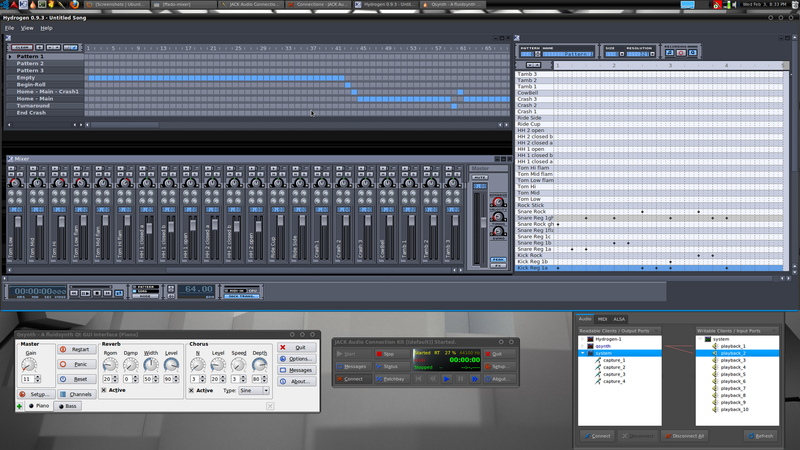 When I first started poking around for audio production software in Linux, I must say, my hopes were not high. I assumed there would be the odd bits of clunky software available - but nothing that would be useful for my needs. Was I wrong! 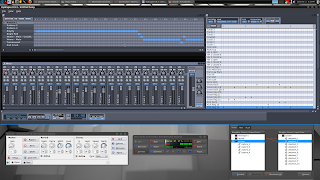 From software synths (Qsynth / Fluidsynth, ZynAddSubFX) to guitar processors (Rakarrack), to audio editors (Audacity), to drum sequencers (Hydrogen), full blown midi sequencers (Rosegarden, Seq24, Muse), Digital Audio Workstation/multitrack recording software (Ardour), to mastering software (JAMin) - Linux is overflowing with great quality audio production software. And what's more, they all tie together with an audio system called Jack. Jack works as a real time, low latency audio patch system to connect any jack aware hardware and software together - however you want. As with any recording system, latency is a huge concern, so ensuring that any 'handling' of the audio is done as efficiently and quickly is vital - this is Jack's job. And as usual, the Linux community has prebuilt a few distros with multimedia creation and editing in mind. I chose Ubuntu Studio for my distribution. It comes prebuilt/preconfigured with many of the applications I listed above - and any others are usually just a apt-get install away. Further it comes with the real time kernel (RT) as default - something that you will need to run if you want low latency/overrun free audio recording. There definitely was a few hoops I had to jump through to get everything up and running (setting of a few processor priorities etc) - I'll discuss those in a later post, but from unboxing my computer (with no OS) to running audio applications under UbuntuStudio took me under 30 minutes. Did I mention I love Linux?